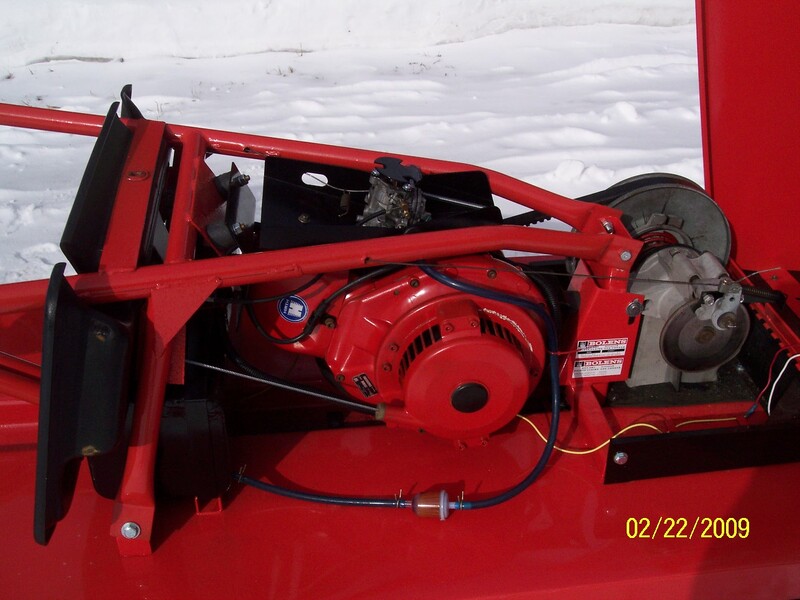 The motor used in the Diablo is a special model of the common 54R Hirth used in many sleds back in the late 60’s and early 70’s. If you find documents on the 54R, you may find information referring to a 54R1, 54R2, 54R3 or a 54R4. Each designation may refer to simple differences like the orientation of the cylinder head on the block or more significant differences like the size of the output shaft. As with most Hirth motors, this 54R# designation is stamped on the engine tag along with a serial number. However, the motor used in a Diablo has no such designation. My theory on this is Hirth made this motor special for Bolens and the motor has two significant differences from the standard motors. One is the small output shaft. The second is the offset recoil mount which sets the recoil off 90 degrees so the motor can be set on it’s side and the recoil pulled toward the head of the motor. 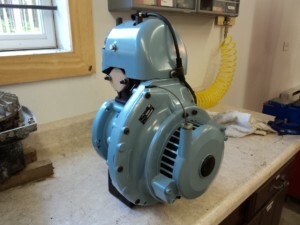 Some early Diablo 500 motors came Hirth Blue which is standard for Hirth motors. Later on, the motors came red. This color red is slightly oranger than the Diablo red. Working on this motor is not complicated, but knowing some techniques help to get it apart with damage. First off, the ignition is under the flywheel. 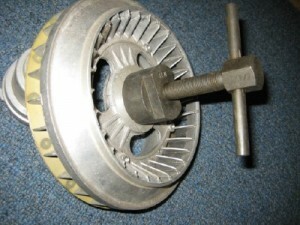 Remove the recoil and outer housing to expose the flywheel. Than turn the recoil hub off the flywheel by turning it counterclockwise. Shown above is the hub removed from the flywheel and the puller installed. Puller available on the parts page. 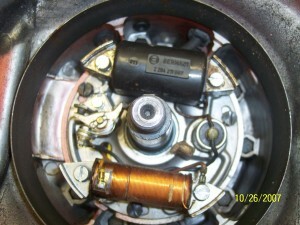 Once the flywheel is off, you can see the points (left component above), the condenser (right above), the ignition coil (black component at top) and the lighting coil (copper coil at bottom). Within the flywheel, you see a spring returned lever which advances the timing as the engine RPMs are elevated. 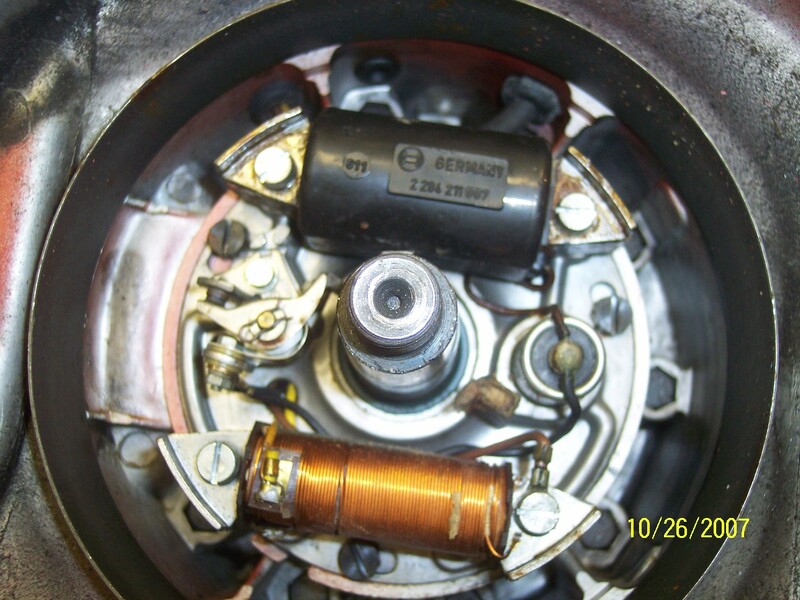 To replace the points, install a new pair without removing the ignition plate from the motor. Then set the flywheel in place and rotate it until the point contacts open up and adjust through the windows in the flywheel. Adjust to 0.016″ gap. To replace the plug wire, mark the ignition plates position by scribing a line. Then remove the plate and replace the wire. Put the plate back in the motor in the same position and the timing should be correct. Should you need to adjust the timing, you first need to find the notation on the flywheel stamped “OlT” which means “On Top” or top dead center. Once you find that, on the motor case is an obvious mark. 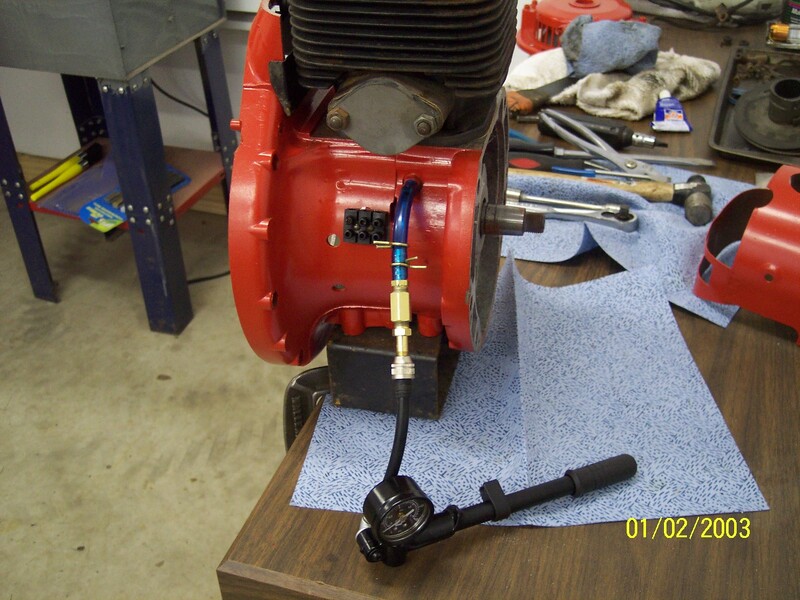 An easy way to locate that is to remove the spark plug and put a rod down into the cylinder. Then rotate the motor until the piston is at it’s highest position. At this point, the OlT should line up with the mark on the casing. Remove the flywheel and disconnect the wire from the points that goes to the condenser and tuck it away. Reinstall the flywheel. Hook am Ohm Meter between the frame of the motor and the black ignition wire coming out of the motor. The meter will tell you when the points are opened or closed. Slowly rotate the flywheel clockwise to a point just before the timing lines meet and watch the Ohm Meter. When the resistance changes, the points have moved. 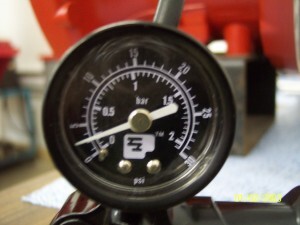 Stop there and measure the distance between the OlT on the flywheel and the mark on the case. This distance should be .49″ which is 7 degrees BTDC. If the measurement is more or less than .49″, remove the flywheel and adjust the armature plate. 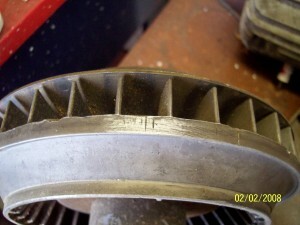 Once complete, remove the flywheel and reconnect the wire from the condenser. Note – have the points adjusted correctly prior to adjusting the timing. Changing the point gap can change the timing. Many manufactures made pistons for Hirth Engines. Some have 2 rings and some have 3. 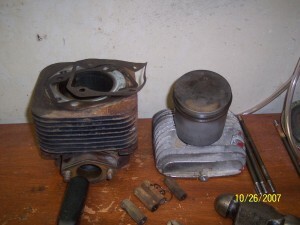 Running motors hot or too lean tends to burn the exhaust side of the piston. When you have your motor on the bench, one of the most important things to check is that the crankcase is sealed. The motor case is a split case and only sealant between the surfaces seal the halves. 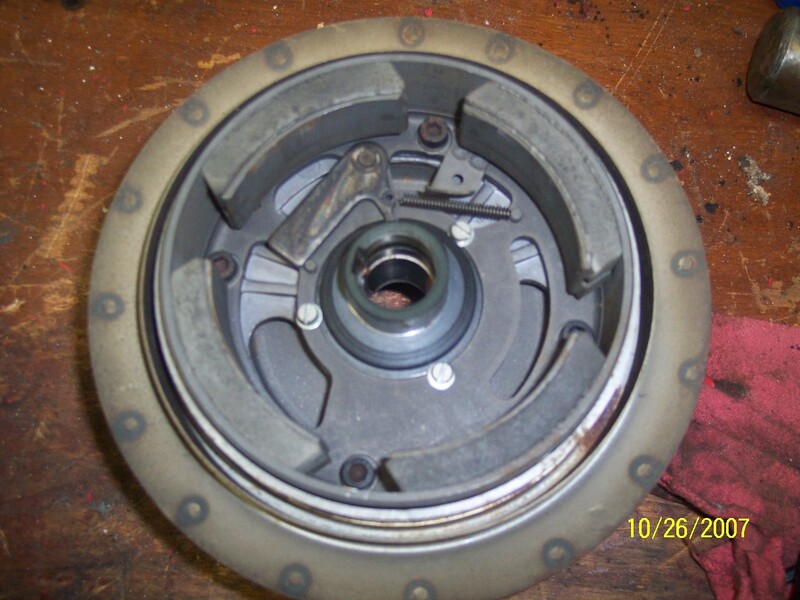 In addition, under the clutch and under the ignition plate are two seals which can often leak. To test the motor, have it assembled with the spark plug in place. Block the intake and exhaust ports with a solid port plate. Then using a pump, pump a few pounds of pressure into the motor and verify the pressure does not leak out. A leaky motor will run leaner than desired and can also lead to many engine problems like poor idle, low power, inconsistent runability and more. Many times people think they have a carbeuration or ignition problem only to find out in the end the motor case leaks.